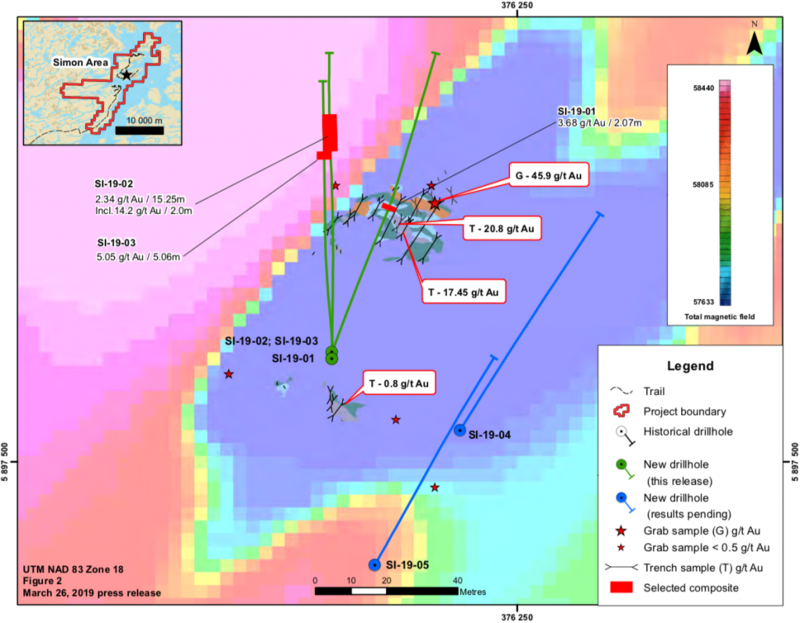 Montreal, March 26, 2019 – Quebec Precious Metals Corporation (TSX.V: CJC, FSE: YXEN, OTC-BB: CJCFF) (“QPM” or the “Company”) is pleased to announce the drill results from reconnaissance drilling on the Simon-JR area located from 6 to 8 km NNE of the La Pointe area, at its 100% owned Sakami project, Eeyou Istchee James Bay region, Quebec. Hole SI19-03 intersected 5.05 g/t gold over 5.06 m.
Table 1: Results of reconnaissance drilling of the Simon-JR area. All widths are drill indicated core length. Insufficient data exists to determine true widths at this time. All gold values presented are not capped. Normand Champigny, CEO of QPM stated, “On this project where a 100-metre mineralization extension is considered significant, our reconnaissance drill holes located from 6 to 8 km from the La Pointe area have demonstrated the extensive footprint of gold mineralization at Sakami. Given these recent results, the Company has elected to plan further drilling in these areas to determine if this is a separate new gold discovery, or whether the La Pointe area extends through this new mineralized area”. The mineralization consists of disseminated to semi-massive pyrite, pyrrhotite and arsenopyrite in a sedimentary iron formation. Similar mineralization has been intersected in each of the DDH. 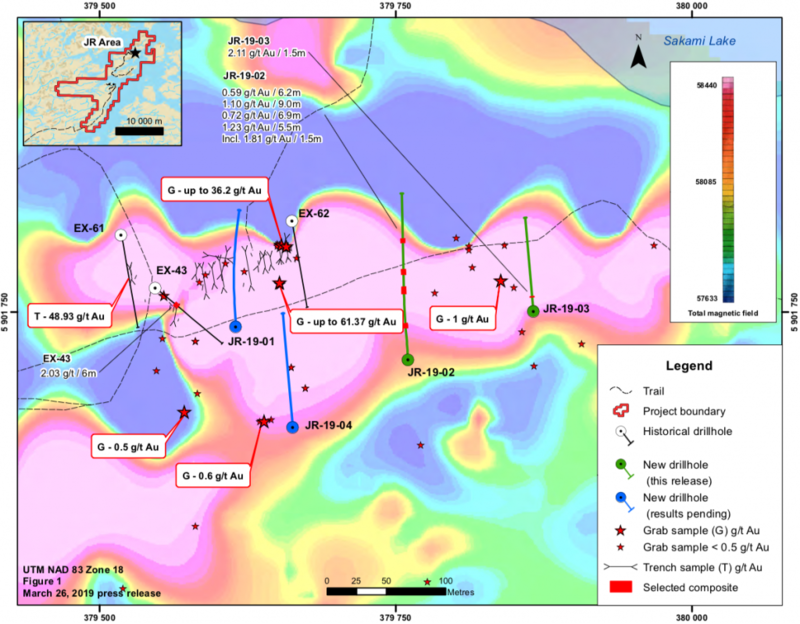 Most of the observed mineralization is hosted in basalts of the Yasinski Group (La Grande Subprovince) in contact with sedimentary rocks of the Laguiche Group (Opinaca Subprovince) to the east. The analytical results from the remaining six (6) holes at the Simon-JR area are expected to be available within the next month. The drilling program continues with five (5) DDH totalling 2,500 m in the La Pointe area of the Sakami project. This is part of the of previously announced diamond drilling (see October 29, 2018 press release) to test down-plunge extensions at depth of the high grade zones, defined as >40 gram-metre drill intercepts (Au g/t x intersection length) and the existence of sub-parallel zones at shallower depths. Quality assurance and quality control procedures have been implemented to ensure best practices in sampling and analysis of the core samples. The drill core was logged and then split, with one-half sent for assay and the other retained in the core box as a witness sample. Duplicates, standards and blanks were inserted regularly into the sample stream. The samples were delivered, in secure tagged bags, directly to the ALS Minerals laboratory facility in Val-d’Or, Quebec. The samples are weighed and identified prior to sample preparation. All samples are analyzed by fire assay with AA finish on a 30 g sample (0.005-10 ppm Au), with a gravimetric finish for assays over 10 ppm Au. The field work was under the supervision of Jean-Sébastien Lavallée (OGQ #773), Vice-President Exploration, director and shareholder of the Company. Normand Champigny, Eng., Chief Executive Officer, and Jean-Sébastien Lavallée, both Qualified Persons under NI 43- 101 on standards of disclosure for mineral projects, have prepared and approved the technical content of this release.